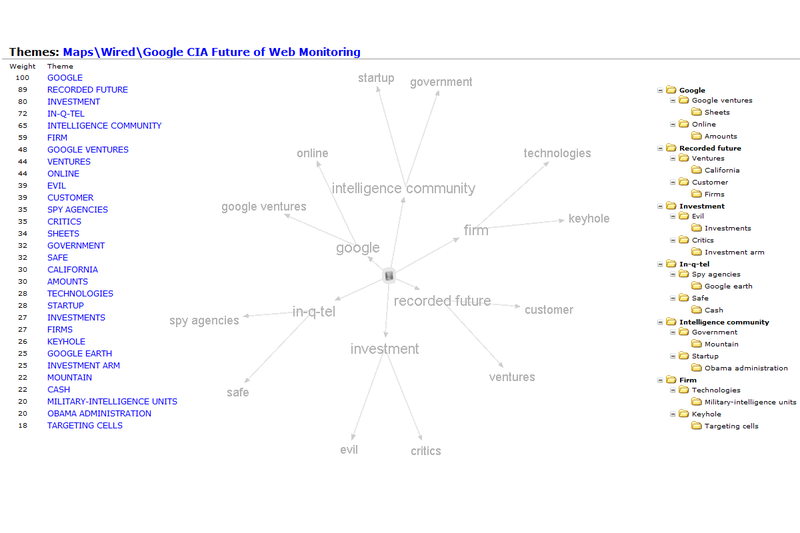 Wired‘s recent exclusive article on new CIA investment in Web Monitoring and Google and while it is a short but interesting read. The military funded the internet and eventually the technology was releases to benefit citizens which lead me to speculate about how corporations would apply the web monitoring technology and ask whether the public sector may already be more advanced. Radian6, Social Radar and other commercial products are adequate for monitoring social media and perhaps the best are still to be found in the laboratories of entrepreneurs or plain hobbyists. The old school competitive analysis vendors also have a stake in the internet monitoring game and the concept of mutually assured destruction where the fear of competition entices some CEO’s to buy internet monitoring software as an insurance policy. Monitoring the internet is valuable if and when the analysis is act on and this in my experience is rare. Look at your competitive analysis or monitoring software and do a simple calculation. Divide the number of words in the reports by the number of words in the database that the system stores. Then multiply that number by the cost of buying the software, operating the processes that the software demands and the related infrastructure costs. My guess is that your result is, more or less, $0 or probably close to the value delivered by the exercise, but there is hope! Monitoring is good when there is a plan and the budget to move forward and get a job done and internet marketing is one very profitable opportunity that benefits from the right kind of web monitoring and here is how it might work. Monitor extensively to identify web content with ‘buzz’–like the Wired post above. Map keyword phrases in content to create a unique blog post–like this one. Adobe’s recent acquisition of DAY Software provides corporations the ability to enhance the miniscule amounts of corporate content on internet sites to counter social media blogs and backlinks that currently overwhelm corporate search engine spiders. A couple of years ago search engines were starting to be influenced by vast amounts of user generated content and people building backlinks which motivate people to build more content faster when they realized that a few hundred posts could make you a star or a lot of money. The Faceboook, Twitter and LinkedIN really took off. Th Social Media sites now generate more content than can be understood by search engines and for those who are looking for the next tool in internet marketing, tightly integrated micro sites is a blogger innovation that you must learn about. People influence search engines by using keyword themes in blogs and product content to shape blog posts to boost page rank, the quality of links and backlinks and connect multiple blog posts for search engine visibility. Web monitoring is good when you have a plan and the ability to boost your visibility to search engines and survive and profit from the upcoming corporate content deluge as global content generation factories come on-line are very good reasons to monitor. Threat Level shows an entrepreneurial lawyer buying copyrights and profiting by suing rights abusers, though I know that Social Media blogers and SEO professionals may not need to fear copyright trolls and can generate content that is better, faster and cooler. In the old days, before search engines, content was king and abuses led to the creation of copyright laws. Today the internet, social media and search engines have crowned a new king, context. Google or BING any product name and you will see the Blog content links overwhelm search engine spiders and easily ranks above the miniscule content on corporate websites and the need to feed the blogs content constantly may be the motivation of the copyright troll though I believe it it a still born profession because of the ability to create context value quickly and effectively. 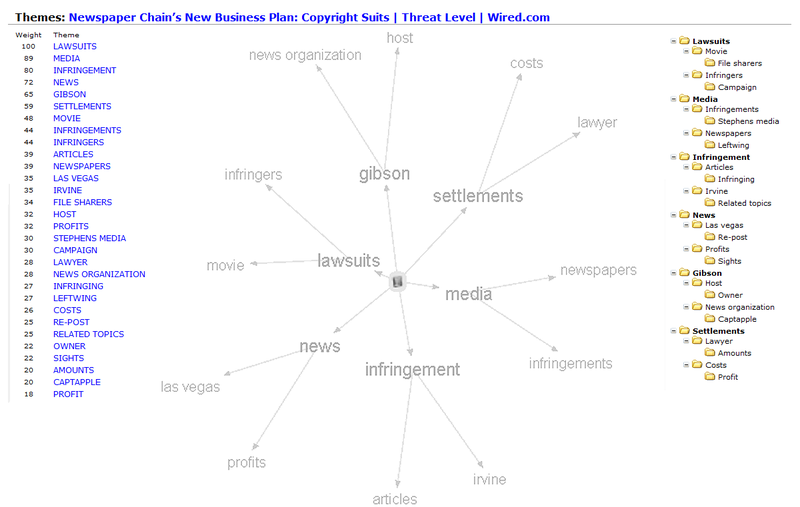 The keyword theme map above is a derivative of a derivative work that was only partially inspired by the Wired artilce. In my analysis of Adobe’s acquisition of DAY software I look at how bloggers or rather the site owners that hold blogs can make considerable amounts of money. Indeed some of the fastest and most innovative work on the internet is being done with micro sites that are ‘echo chambers’ that attract search engine spiders and the attention of the searchers that they serve. Adobe’s acquisition of DAY creates a corporate content factory which can be sold to global business who lack the resources or creativity to compete with social media bloggers. Another form of ‘mutually assured destruction’ with content rather than bombs. So why the Copyright Troll? We already know Social Media blogs overwhelm search engine spiders and thousands of entrepreneurs, a new intermediary class, swiftly and deftly step between manufacturers of drills, hepa filters or other products and internet giants like Amazon, Ebay and Google. They don’t need to rip off data and can easily offer context to create wayfinding value quickly and simply. Bloggers, SEO professionals and link builders will immediately see the contextual value of the map created by SpeedSynch internet marketing software. All they have to do now is to create 300 word unique blog posts and place them everywhere, just like the newspapers do but don’t need copyrights and are unencumbered by revenue sharing deals, and this is simple and legal. Once other social media site visitors see the unique 300 page articles they blog about them and link to them. On Twitter it is a re-Tweet and on LinkedIN it is a backlink in a ANSWER or group or share–the possibilities are endless. In a micro sites or WordPress blogs the keywords in the SpeedSynch map above are used for pages categories, navigation button links and blog keyword tags. All of this naturally attracts the attention of search engine spiders how follow all of the back links to the unique 300 page article and people that type those keywords into Google or BING find the article too, and very fast. There is no need to fear the Copyright Troll, Social Media has already made him unneccessary as it is easier and more profitable to behave and exploit the business models that place too much value on search engines and copyright. This post may not be appropriate for everyone. The simultaneous purchase and selling of an asset in order to profit from a differential in the price. This usually takes place on different exchanges or marketplaces. Also known as a “riskless profit”. I ‘arbitrage’　risk when delivering services, projects or events by working with my client simultaneously on different　project elements. While this seems normal for most project managers, let’s look at the risk perspectives and you may discover something unusual that you can exploit. The purist will look at the definition above and instantly notice that a delivery of services to one client obviously doesn’t meet the definition of arbitrage. However, even when we both work on the same part of the project or in ‘the same market’ we work in ‘parallel’ in that both parties work and educate each other simultaneously. We are in the same ‘physical’　place BUT in different intangible markets or spaces. When I employ risk arbitrage with my client projectss we are trading expertise simultaneously. My expertise is the problem definition, perspective orientation, technology training, deployment support and end user tuning and training. The client’s expertise is in the transactional systems, datasets, internal technologies, processes, metrics, external customer and partner requirements. The movement of risk ‘away’ from the project happens because the client works in their ‘space’ and incur little to no risk in their knowledge zone. I minimize their execution risk associated to new technology or techniques. This is magical as I send risk to them which disappears when they work and they send risk to me which disappears when I work. The shift from the physical definition of arbitrage to intangible components defined in as expertise above allows me to　deliver 4 to 6 weeks projects that would take other firms 6 months to deliver. Even when other suppliers match my quote to keep the work their delivers are one sided and they put their best people on the projects to get the work done ‘fast’. This however invariably leads to distress as the client is ignored not to ‘slow them down’. When this happens the entire project risk returns, both knowledge risk and execution risk. Why is my approach risk arbitrage? Let’s begin with the arbitrage definition above–there is profit by its successful deployment. There is a ‘transaction’ in that the client buys expertise and has the expectation of an outcome in one portion of the project. I ‘buy’ the client’s ability to deliver expertise and a positive outcome in another part of the project. What about the price differential? The client’s internal ‘price’ of consulting services is lower than my external price. The client receives knowledge transfer and solution(s) in parallel. If you don’t arbitrage risk, it will bite and usually not your client. An ‘expert’　may not　agree with my applying arbitrage to my project approach though　I　go beyond risk mitigation which is ‘playing defence’. My risk arbitrage approach is purposeful, positive in thought and taught to clients so that they can achieve future benefits. Did I mention that I deliver projects without a typical project plan? This is where I lose the traditional project managers, actuaries and those who like black and white. My projects have objectives, tasks, deadlines and quotes but I work with clients to simultaneously deliver value in an integrated approach while employing risk arbitrage. At the end of the week we determine where we are, where we must go and the balance of work. We simultaneously design, build, train and tune because we employ off-the-shelf software with a flexible User Interface. Maybe, but I have plenty of references in Canada and the US. Can I do that too? I discovered this unique risk　relationship by accident while delivering Microsoft based analytical solutions 5 years ago. On the other hand if I was not a story teller and fully recovered accountant I wouldn’t have noticed. Competing on Analytics is a common refrain in the executive suite but when analytics get out of synch, they hurt. The most critical disconned happens when numbers and stories get out-of-synch. SpeedSynch keeps numbers and stories in synch and with common Microsoft technology–GEMINI and FAST. Visit us to see how we use Microsoft’s GEMINI to synch numbers and FAST ESP search to synch stories.